SealedMedia enables you to combine document protection and control with your existing applications, such as Microsoft Word, Microsoft Excel, Microsoft PowerPoint and Email. It seamlessly integrates with your existing IT infrastructure (e.g. Document or Content Management Systems) and business processes, without detracting from the user experience or negatively affecting the workflow. All actions performed on a sealed document by each recipient can be recorded. Notifications of each action can be generated automatically. SealedMedia can be transparently incorporated into existing business processes, such as document management systems or databases, so no change of process or staff retraining is necessary. A SealedMedia� solution can be up and running in a matter of days. Minimal installation costs; integration with existing systems means that the benefits of persistent document security can be delivered quickly and cost-effectively. Enables scalability for complex systems in large organizations without necessitating granting of individual rights for each separate document. Anyone, both inside or outside the organization, can install an Unsealer and receive sealed documents: only those with rights granted to individual documents can subsequently access them. Access to obsolete or incorrect content can be withdrawn, forcing recipients to obtain the current version. Embargoed information can be distributed in advance of the deadline, rights being granted from the moment of the deadline. The license server runs on Microsoft Windows 2000 or later including Microsoft Windows XP. It supports SQL Server 2000 and Oracle9i�. At SynapseIndia we can install, configure and manage the Sealed Media License server to manage your digital information in a most secure manner. 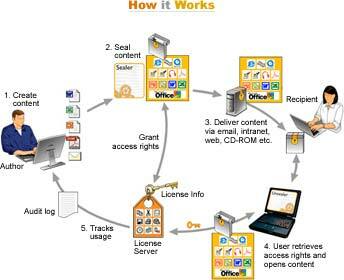 We can even integrate it with your existing systems for complete document protection and delivery of your documents. A team of technical experts will work with you to design, prototype, test and deploy exactly the right solution to attain the security level needed to achieve your business objectives and will continue to assist you during the project delivery phase according to a project plan jointly agreed with you.